Sitting on top of a beautiful hill in the middle of the Umbrian country side, Ostello Bello Assisi Bevagna is a hidden gem, the perfect get-away. The tiny medieval village will take you back in time while allowing you to access everything the region has to offer. Whether it is nature, history, cultural events, gastronomy or outdoor adventures that spark your interest, this is the place to be. 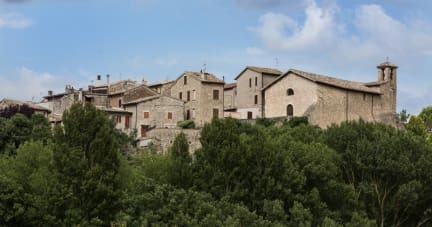 Umbria has nothing to envy her neighboring Tuscany: while offering the same breath taking views and activities its tourism hype is more undertone, allowing you to enjoy the authentic local vibe. Our hostel is situated in a medieval town called Torre del Colle situated in the Province of Perugia, in the Umbria region. The village is located in a strategic position to explore central Italy. Here in Umbria, nature provides you with the most beautiful playground. Stretch your legs on a hike or bike ride or turn up the adrenaline by rafting and horse riding. Take in the view from the sky on a hot air balloon ride or, if you’re feeling adventurous, by paragliding. For all our guests we offer a Continental Breakfast in our lounge with open view to the valley of Assisi and Monte Subasio. The hostel has several buildings scattered through the village which the guests have access to at any time: kitchen, chilling area, breakfast room, outdoor garden (with grill/barbecue and a clay oven) and a swimming pool. Every room is provided with linens, towels and air-conditioning. From Assisi, the easiest way to reach us is to take the SS75 and exit the highway at Foligno Nord. After that, follow directions for Bevagna staying on the SR316. A few kilometers after the Topino river you will reach the eastern gate of Bevagna. At the crossroad turn right on to Viale Properzio and continue for 300mts circling the park. Once the street ends, turn right on to and then left on to Via Alcide de Gasperi. After the curve you will see Bevagna's walls on your left. Continue for about 100mts. After the parking lot turn right and follow the road for 3 kilometers following directions for Torre del Colle. After the hill you will have a beautiful view of the valley on your right and no longer after you will see the gates of Torre del Colle. Welcome! - Cancellation policy: 24 hours before arrival. Such a great hostel! I loved my time here. It’s a great escape from the city. I would definitely recommend renting a bike and taking a trip into Assisi or one of the nearby towns. There isn’t a lot to do in the town where the hostel is, but that is part of the allure. The staff is so friendly, and I wish I stayed longer. I am a cheap traveler. 35 dollars a night seemed slightly pricy for a hostel; every penny I spent for a room at Ostello Bello was worth it. It’s difficult to describe without sounding hyperbolic. I felt like I was transferred back in time, living within gorgeously renovated Roman ruins. Perfectly located for exploring the Umbria valley, the appeal of this hostel is in the silence, peace and nature that surrounds you. It will immediately work it’s magic upon you, as it did to me. I cannot recommend this hostel enough. GO GO GO if you are in central Italy. 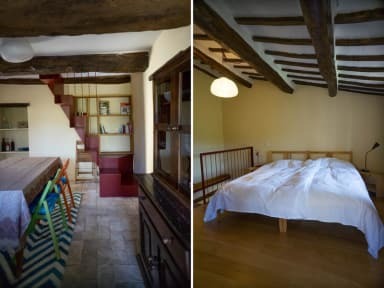 Stay in a beautiful medieval village in the middle of the Umbrian countryside and enjoy spectacular views and incredible company in the amazing humans who run this hostel. It is truly magical and I did not want to leave! My time spent here was so incredible I had to extend my stay another 2 nights. The staff here are so welcoming and helpful with anything you need. Shout out to Candela, Cartia and Diego for making me feel like I was family. These guys went above and beyond to make my stay eventful and fun by organising my trips to town, wine tours, bike rides etc. Can’t thank you guys enough and I’ll definitely be coming back in the summer! Thanks so much to the staff who go above and beyond! Staying at Ostello Bello is an experience, not just a place to sleep. The staff is amazing, the beds are clean and nice - and they have linens for both warm and cold weather. The village also has a bike rental which is highly recommended, a tobacco shop (like a kiosk with an espresso machine) and an amazing restaurant. If you're a family our a couple we'd really recommend the tower suite (yes, you'll have a tower with terasse for your self!!). Anyways, you just simply have to go here. Thank you! Taken care of by the attentive staff who are there to basically just be your friends and cook for you. Watch out though they will charge you for every beer you drink, which is fine because everything else is free. Went on a great excursion with some of the workawayers, great view of the countryside and of Saint Francises Basilica. Its a place you go to just chill, to get a taste of rural existence and to feel right at home the second you get there. I’ve been traveling for 2 months and I have to say Ostello Bello has been my favorite experience. I came here planning on staying for two nights, but I’m now approaching my 8th day here. The staff, Candela and Felipe are amazing people who make everyone feel welcome. & Being in a town (kind of a castle) like Torre allows you to experience Italy in a different way than staying in big cities like Florence and Rome. Also, they just got a new telescope, and w/ no light pollution it’s amazing.